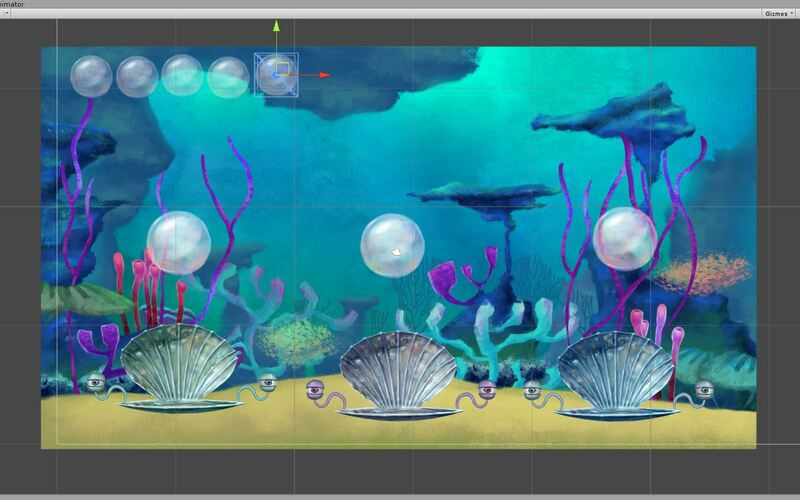 The second Langeroo Adventures game in development is Oyster Ocean. Oyster Ocean is a little different from Tortoise Beach as it teaches something very specific. Many of the games work with all 350+ words from the Langeroo Word Bank whilst some, such as this one, are a little more independent and bespoke – we have games that teach the alphabet (such as this one) along with games for specifically teaching numbers, shapes, and colours. 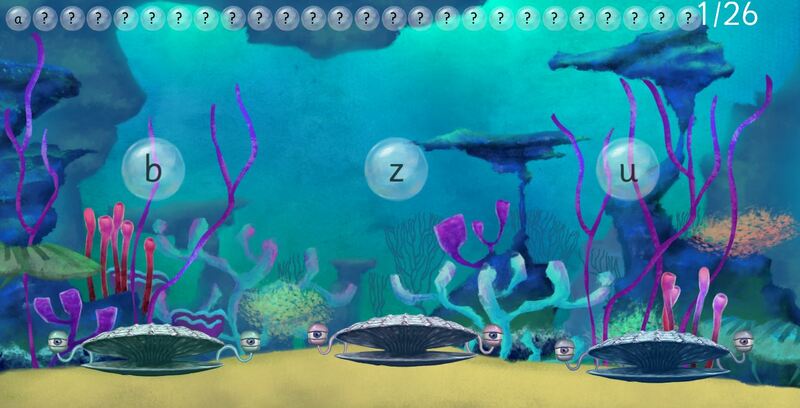 In this game, there are three oysters sitting at the bottom of the ocean. They each open their shells, releasing a bubble containing a letter. The child would click the bubble containing the first letter of the alphabet. If correct, the bubble drifts to the top left of the screen, and they move on to the second letter of the alphabet. It was important for us that the oysters have characters, and so our artist, Alex, has been busy giving them some personality – they pull faces when the child clicks a wrong answer, smile with delight when the child gets an answer correct, and they give a massive grin once t he child has completed the entire alphabet. Having characters that our users can relate to, and give delightful interactions, is a great way to inspire learning and exploration. As before, we intentionally made the positive animations (the smiles, and the big grins) more fun and interesting than the animations that occur if a child selects the wrong answer. Again, this game is built for playing with touchscreens, as well as mouse and keyboard. We’re also thinking about gesture based controls too (how cool would it be, on Kinect, for the child to burst the bubbles with their fingers?). It’s also really important that each environment feels alive. You can see the ocean is full of gentle movements which don’t distract from the game, but make the world feel alive. We’re hoping to add more interaction in each environment too with some non-gameplay interactions.